UPDATE LATE 2017- Myxomatosis is once again rare in pet bunnies in Adelaide, but vigilance is essential. Please let us know if your rabbit becomes infected. Myxomatosis is a serious and common disease of pet rabbits in Adelaide. 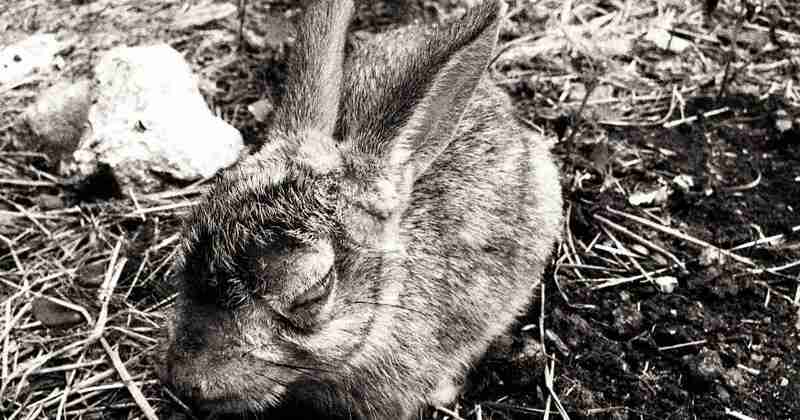 We’ve put together this information for rabbit owners about preventing and treating myxomatosis. Read more about the 2016 outbreak below. Important: do not confuse myxomatosis with rabbit calicivirus. You can read all about Rabbit Haemorrhagic Disease and calicivirus here. How Do Rabbits Catch Myxomatosis? Myxo is mostly spread by biting insect vectors such as rabbit fleas and mosquitoes. In suburban areas, most rabbits will catch myxomatosis via mosquitoes or other blood sucking insects. It is also possible for myxomatosis to be spread directly from other affected rabbits. Myxomatosis also clearly occurs in epidemic (‘epizootic’) events, probably responding to weather conditions that favour the insect vector. For example, the outbreak in Adelaide in October 2016 occurred in a warm spell following widespread flooding of agricultural areas and prolonged wet conditions. How Do I Prevent Myxomatosis? 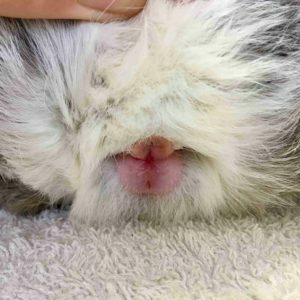 Use these parasite protections on your rabbit. Of the choices, neither is likely to exert a strong repellent effect. A product with a proven mosquito repellent effect that has been tested in rabbits is Advantix (the smallest size used in puppies); see the reference to its use in rabbits below. Please be warned: it’s use is off-label and cannot be guaranteed to be safe despite preliminary testing. Using off-label ivermectin may work but is not recommended. There is an excellent safe alternative in selamectin, however both require the flea to bite to kill it. Quarantine all new arrivals for at least two weeks- if one rabbit gets myxo, separate all the rabbits until it is known who else is infected, wash hands between handlings and use separate food and water containers. Is There A Myxomatosis Vaccine? No. Although the vaccine is available overseas, it is illegal to use it in Australia. It is a case of conflict between the needs of farmers and the needs of rabbit owners. Current vaccines use a modified live virus. The Department of Agriculture fear that this could spread into wild rabbits if it was used in Australia. If this happened it could also protect wild rabbits from myxomatosis. Rabbits are indeed a significant cost to Australian agriculture, but using myxoma virus as rabbit control is cruel and needs to change. 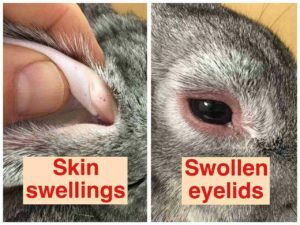 Myxomatosis produces severe symptoms and causes significant suffering. Survival rates in pet bunnies are low. Therefore, it is often kindest to euthanase affected rabbits when they stop eating. Some rabbits can do well with supportive care such as fluids, anti-inflammatories and antibiotics. It’s also advisable for vets to hospitalise severe cases for intravenous fluids. Owners must always put the welfare of their rabbit ahead of everything else. If a rabbit is not responding to treatment or becoming dehydrated, then euthanasia is the most humane choice. 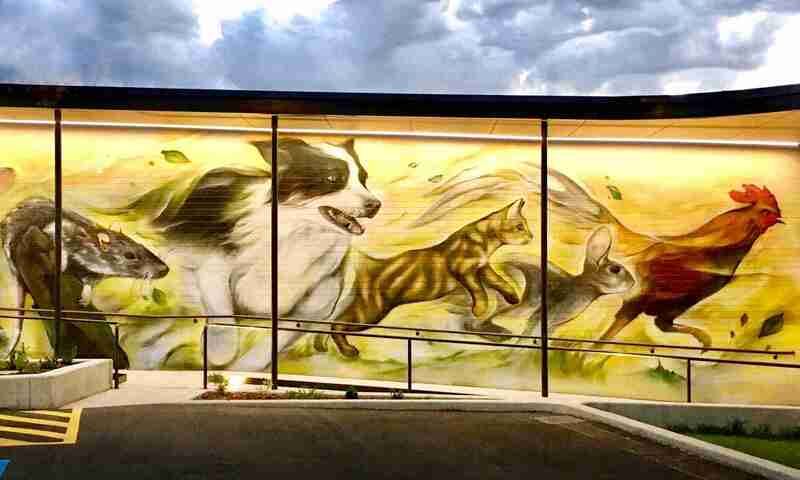 Where Is Myxo In Adelaide? We are still hearing of deaths throughout the city. It’s hard to tell if the outbreak is weakening so please keep up the protection. Our veterinary association has advised waiting one more week before letting your bunnies out. Better safe than sorry! When out it’s still worth keeping up the mosquito protection too. Finally some good news! We think the disease is now on the wane in Metropolitan Adelaide except in the south. Let us know if you hear of any new cases we’re not aware of. If you live in the south it’s worth staying in touch with your local vet. It’s fair to say that by this time any rabbit in Adelaide or country South Australia is at risk. If you hear of any others, please call or leave a comment below. Based on experience of previous outbreaks, we advise rabbits be kept inside for at least one month. We will keep you updated on this page and via our Facebook. Hansen, O., Mencke, N., Pfister, K., & Beck, W. (2006). Efficacy of a formulation containing imidacloprid and permethrin against naturally acquired ectoparasite infestations (Ctenocephalides felis, Cheyletiella parasitovorax, and Listrophorus gibbus) in rabbits. INTERNATIONAL JOURNAL OF APPLIED RESEARCH IN VETERINARY MEDICINE, 4(4), 320. We had to put down our two boy bunnies with myxo and now one of the girls has it also. Our other girl is OK at this stage. We are in Tea Tree Gully. Very sorry. There are certainly still deaths being recorded – we can only hope winter will finish this outbreak for good. We’ve just euthanised one of daughter’s bunny’s today, as a result of Myxomatosis infection – Adelaide Hills region. We’ve got a second bunny (belonging to another daughter!) which we are now waiting to see if she gets/is already infected. It’s still around! I’m on Yorke Peninsula, S.A and I’m still losing rabbits to myxomatosis. (Lost 80% recently to Calici) I have one doe with myxo have a litter of kits that are only just coming out of the burrow now. I’m hoping that they will be able to look after themselves now. Such a young age to fend for themselves. I now have only 5 rabbits left out of around 30. I’m in Clearview and we’ve lost 13 in 9 days…. so far we’ve had 3 days of no symptoms but I’m expecting that to change. My heart goes out to every one that has/is experiencing this dreadful disease ? Had my rabbit euthanized today. We live in Devon Park. The vet said he was the sixth this week they had seen with myxomatosis. Thanks very much for being able to let us know. We’re very sorry. Sorry to see you lost your rabbit to myxomatosis. Previous PostPrevious Does Bravecto Kill Dogs?